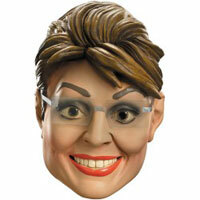 Disguise yourself as former Vice Presidential candidate Sarah Palin for Halloween! 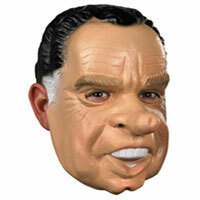 These political masks fit most adults. Have fun on Halloween night and put Tina Fey to shame with your own impersonation of former Governor Palin. Also popular for Halloween, zombie Palin face masks which are available in limited quantities so buy them while you can before they go out of stock in October! 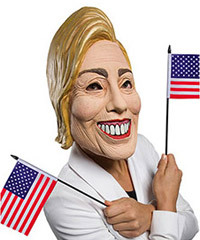 Disguise yourself as Alaska's former Governor and former Vice President candidate Sarah Palin for Halloween with this humorous character mask. Wanna go political Halloween style? 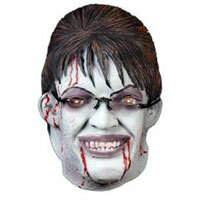 Become a zombie version of famous politican and former Governor of Alaska Sarah Palin for this Halloween. Sarah Palin's former running mate is John McCain. 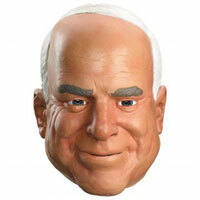 This former GOP Presidential hopeful's face disguise is an adult size vinyl Halloween mask.